Settlers of Catan is a pretty straightforward game. 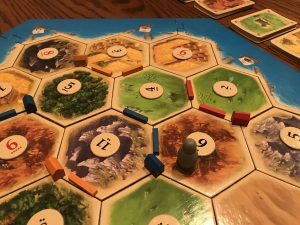 You play as a group of settlers setting up on the fictional island of Catan. 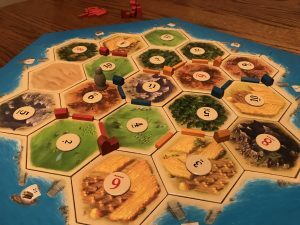 To do that, you’re going to have to compete with other players to collect all the brick, lumber, ore, grain, and wool that you need to build roads, settlements, and cities. The standard game can accommodate up to four players and it can be expanded for up to six. Collecting these resources is pretty simple. Each tile produces a resource type (except the desert, which produces nothing) and each tile has a number on it. At the beginning of each turn, the active player rolls two six-sided die. If any player has a settlement touching one of these tiles, they get one of that kind of resource. If they have a city, they get two. Sounds simple, right? Well, just wait until you’re holding out for that one resource you need to finish what you’re trying to build. Here’s where the game can get truly competitive. If a player rolls a seven, no one gets resources. Instead, players who have more than seven cards in their hand have to discard half. Then the active player places the Robber on a tile and steals a card from another player who is on that tile. As long as the Robber is on a tile, no one can get resources from that tile. Catan is really easy to learn. 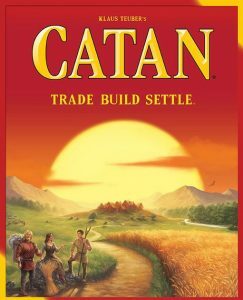 If you have friends or family members who are hesitant about playing board games, Catan is an easy place to start. Catan can accommodate a wide variety of skill levels, so it’s a great choice for a family game night. Catan has good replay value. Because you put the tiles out randomly, the island looks different each time you play. Resources change in value each time you play, depending on what kind of numbers they have. Each game mixes up well. This game does a fun job of creating its own economy that I really like. Trading can get creative. Knights (cards that let you move the Robber when a seven isn’t rolled) can ratchet up the tension. 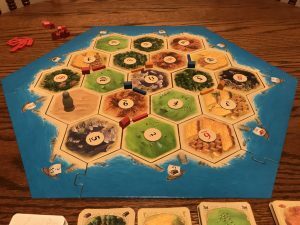 Catan really gets players to play together and not just at the same time. Catan is notorious for one major shortfall. If you get a run of bad luck, it can ruin your game. Getting the resources you need is dependent on your numbers getting rolled. If you go some time without getting resources, you can get seriously behind – maybe even too far behind to catch up. This is the only bad thing about Catan in my opinion, but it’s a significant weakness. If you’re just getting into playing board games, I’d recommend Catan as a fantastic place to start. If you play games with children (10+ years old), this is a wonderful game to pull out. Seasoned board game players will outgrow it, in large part because of it’s dependence on the dice rolls. Even still, I come back to this game fairly often. Settlers of Catan isn’t the definitive board game but, in my opinion, it’s a must-own. No collection is complete without it. This entry was posted in Articles, Board Games, Review and tagged Board Games, Catan, Review, Tom. Bookmark the permalink.